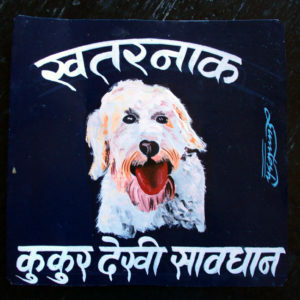 Folk Art Schnoodles hand painted on metal in Nepal. 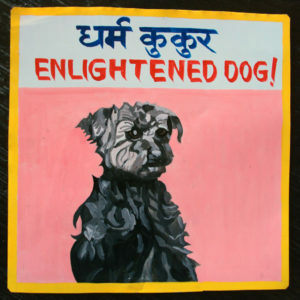 This hand painted portrait of Ernie the Schnoodle was painted by Shree. He has gone to South Korea to work and this was left in his shop. I bought it from his wife Bimala to give them some extra income while Shree is away. This hand painted portrait of Charley the Black Schnoodle is almost cubist in its style. A Schnoodle is a mix of a Schnauzer and a Poodle. Sagar is never one to disappoint when it comes to drama. 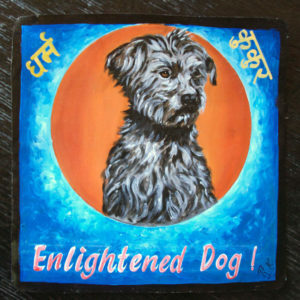 Sagar’s portrait of Charley the Schnoodle sets the little dog in a circle of orange surrounded by a blue halo. 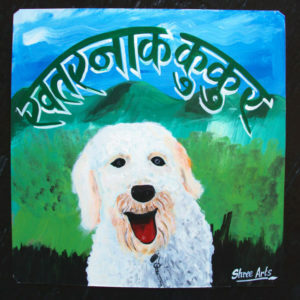 Ernie the white Schnoodle is hand painted by Santosh Shrestha. 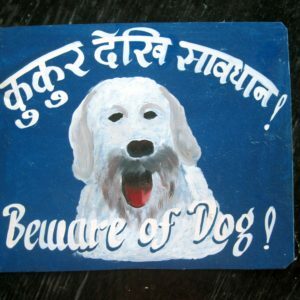 Ernie the Schnoodle’s young master only wanted Nepali Devangari script on his portrait of his dog. This painting by Shree Laimachhain is typical of Shree’s style. Shree’s story is fascinating. Click on the ‘about the artist’ link above for more information.